Last winter I made my mother in law a felt square wreath. It turned out SO cute that I have been dreaming of one for my own home ever since. I have a lot of wreath ideas constantly swirling around in my head so I didn't really have a season or holiday to make one for since I already have a lot of wreaths (and ideas for new ones)! After someone handed down a bunch of kids hangers to me and I had nothing to do with the wire ones, it hit me! I should make a miniature version for my girls' bedroom door. It was perfect timing, because right after I had this epiphany, Hobby Lobby opened in our town! I was heading there to buy supplies for another wreath idea I had (I told you, I have a wreath problem), so I picked up this stuff for just a few dollars and went on my way! I have seen versions of this type of wreaths on several blogs over the last few years, but I decided to go with Lyndsey's hanger method-it seemed most simple! I had tried that with my MIL's wreath and so I knew I'd do that again! First: Cut each of your felt sheets into about 2"x2" square (12 squares per sheet). Second: Unravel your wire hanger and form it into a circular shape. Mine had a coating on it that I had to peel back around the neck of it to get to the wire so I could unravel it. Third: Push each piece of felt onto the wire hanger. 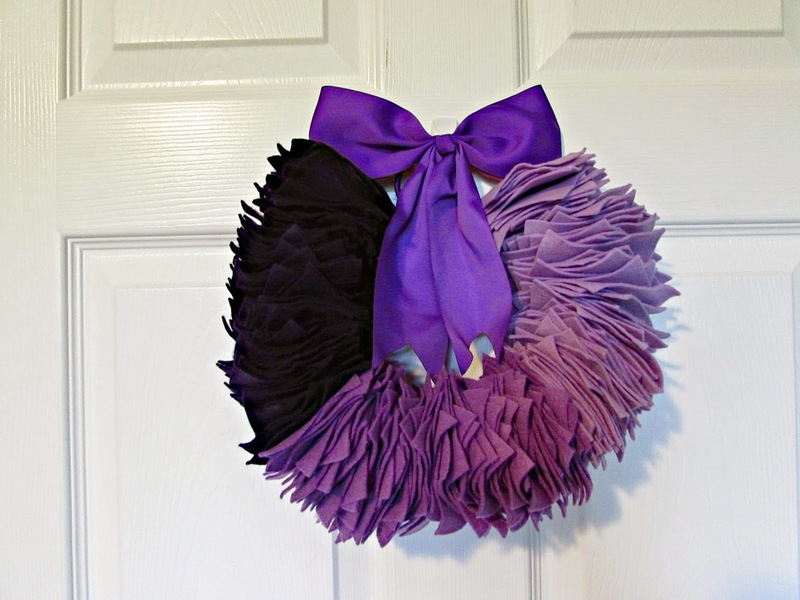 Fourth: Add your bow or embellishment on the top, and hang! And you're done! 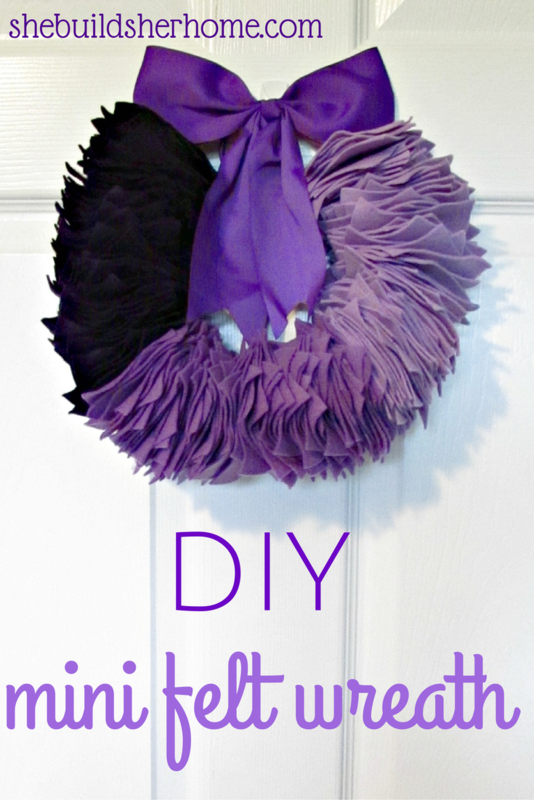 It is such a really easy and inexpensive craft! To attach it to the door, I just used a 3M hook! The fun thing about this kind of wreath is that there are so many options! I chose to do this one in an ombre pattern, with 3 different shades of purple, but you could do one color, do every other square a different color, or do a chunk in one color, then another chunk, then another chunk, then start over. The possibilities are endless! 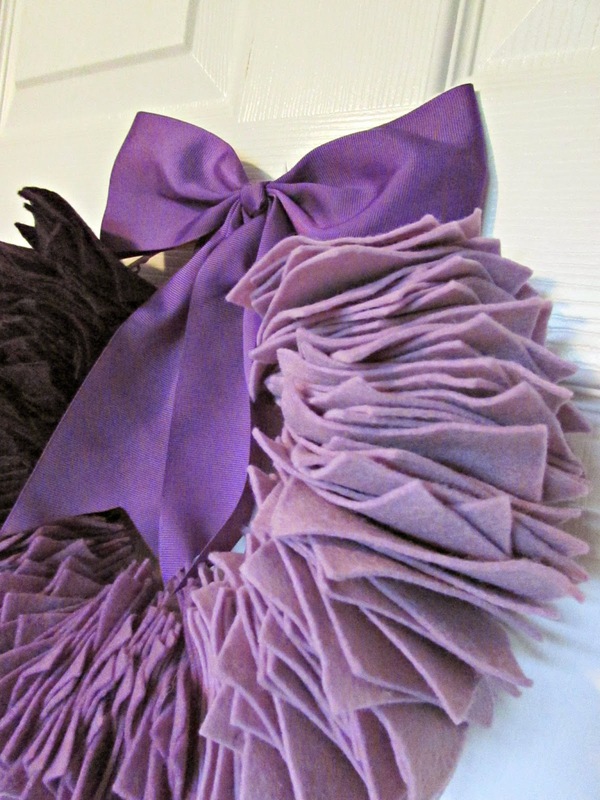 Have you made any fun wreaths lately?! Beautiful! You are so crafty! And purple is my favourite colour!